LIMITED TIX - INC GST. You must be Over 18 to purchase this ticket - Apart from the RAD VIP HUMAN experience you will secure a seat on a coach for three days hosted by Dallas Frasca. This ticket includes free entry to all 9 events and some food and drink will be provided. Motel style Accomodation (Friday & Saturday Night - 3.5 star). Linen and Towels will be supplied for both nights. N.B. If you are booking more than one ticket you will automatically be allocated a room/s for that many people. Pick up and drop off secret location Melb CBD. RETURNING FRIDAY 1 – SUNDAY 3 NOVEMBER 2019! 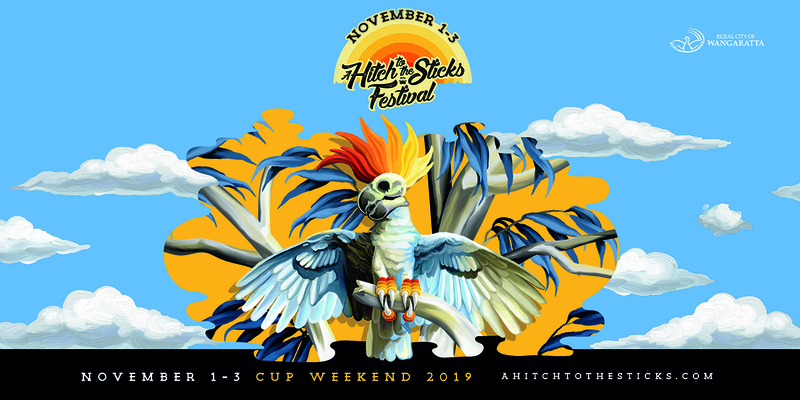 The world-first festival sensation – A Hitch To The Sticks (AHTTS) – returns in 2019 with a huge reveal for the Wangaratta community and wider regions. AND THIS ONE’S FOR YOU! Earlier this year, Rural City of Wangaratta announced they were searching for an event to fill in for this year’s Wangaratta Jazz Festival’s calendar event while their committee gears up for the beloved festival's 30th Anniversary in 2020. It can now be revealed that A Hitch To The Sticks is the frontrunner from 6 stellar submissions. As part of A Hitch To The Sticks' ongoing commitment to reinvigorating the North East Victorian live music scene, The Rodeo Grounds (behind the Showgrounds) will be activated as a brand new live music location for the region and will be host to one of the three, huge family-friendly events that's set to take place over the Melbourne Cup weekend as a part of the program. For locals wishing to experience A Hitch To The Sticks 2019, weekend and individual event passes will be available for purchase very soon. But what you really want is to be one of only 50 bus ticket holders/VIP Humans. With Dallas as your host, VIP passengers will be treated to a three-day musical bus safari, which takes off from (and returns to) the Melbourne CBD and includes exclusive access to six events that will be held at secret locations (celebrity hitchhikers, singalongs and maybe even the adventure of your life) as well as all three public events. Be quick, because this VIP experience always sells out! And while we’d love to tell you everything that's in store for the VIP bus ticket holders, we simply can't out of respect for the tradition of the road: what happens on tour, stays on tour.